Vaisala BAROCAP® Digital Barometer PTB330 is a new generation barometer, designed for a wide range of high-end atmospheric pressure measurement. The pressure measurement of the PTB330 is based on the Vaisala in-house, silicon capacitive, absolute pressure sensor - the Vaisala BAROCAP® Sensor. It provides high measurement accuracy and excellent long-term stability. The PTB330 series is highly accurate. The Class A barometers for the most demanding applications are fine-tuned and calibrated against a high-precision pressure calibrator. 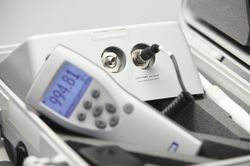 Class B barometers are adjusted and calibrated using electronic working standard. All the PTB330 barometers come with a NIST traceable, factory calibration certificate. According to customers’ choice, the PTB330 can incorporate one, two or three BAROCAP® sensors. When two or three sensors are used, the barometer continuously compares the readings of the pressure sensors against one another and provides information on whether these are within the set internal difference criteria. This unique feature provides redundancy in pressure measurement. Thus, users also get a stable and reliable pressure reading at all times as well as a pre-indication of when to service or recalibrate the barometer. The PTB330 can be set to compensate for QNH and QFE pressure used especially in aviation. The QNH represents the pressure reduced to sea level, based on the altitude and temperature of the observation site. The QFE represents the height corrected pressure of small differences in altitude, for example, the air pressure at the air eld elevation. The PTB330 features a multi-lingual, graphical display allowing users to monitor measurement trends. The graph is updated automatically while measuring and it provides a one-year measurement history. In addition to instant pressure, the PTB330 also provides the WMO pressure trend and tendency codes. The PTB330 can be used successfully for aviation, professional meteorology, and for demanding industrial pressure measurement applications such as accurate laser interferometric measurement and exhaust gas analysis in engine test benches. The Vaisala BAROCAP® Barometer PTB110 is designed both for accurate barometric pressure measurements at a room temperature and for general environmental pressure monitoring over a wide temperature range. 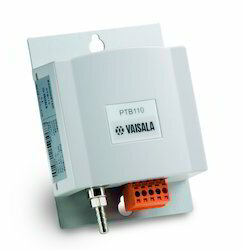 The PTB110 barometer uses the Vaisala BAROCAP® Sensor, a silicon capacitive absolute pressure sensor developed by Vaisala for barometric pressure measurement applications. The sensor combines the outstanding elasticity characteristics and mechanical stability of single-crystal silicon with the proven capacitive detection principle. The excellent long-term stability of the barometer minimizes or even removes the need for field adjustment in many applications. The PTB110 is suitable for a variety of applications, such as environmental pressure monitoring, data buoys, laser interferometers, and in agriculture and hydrology. 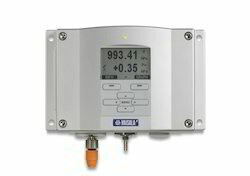 The compact PTB110 is especially ideal for data logger applications as it has low power consumption. Also an external On/Off control is available. This is practical when the supply of electricity is limited.